I made this as a Christmas gift for K. She is still young enough that I can show her things and she doesn't question what they are for so I showed her this. It was interesting to listen to her interpret it. It will hang in her bedroom or in the living room, I am not sure which. I wrote a tutorial at Suite101 about how to make your own silhouettes from photos. A photo ornament that I made last years. What a lovely gift. Something to be proud of. I love the idea of the photo-tree-ornament. I show Issac his gifts all the time--he doesn't care --he likes knowing what is coming, not so keen on surprises. This is adorable. What a beautiful piece and somehow the silhouette does tellits own story. Very nice take on an old style of art. I like the Victorian feel. Oh Melissa ~ it's beautiful; what a treasure! My sister and I were always best friends (and still are very close). 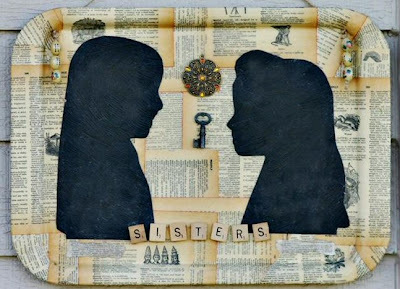 I love anything that celebrates the beauty of sisterhood. That is so wonderful. 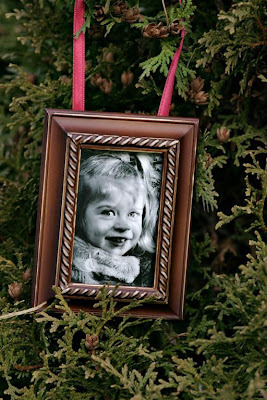 Gifts and decorations with kids' photos or artwork are always the most special.